A woman pours Sweet'N Low into a coffee mug. When it comes to dieting, most of us are willing to resort to a trick or two to help us curb our appetite and eat less  drinking water to fill up when we're hungry, for example, or opting for artificial sweeteners instead of sugar to get the same satisfying sweetness without the offending calories. But new research suggests that the body is not so easily fooled, and that sugar substitutes are no key to weight loss  perhaps helping to explain why, despite a plethora of low-calorie food and drink, Americans are heavier than ever. In a series of experiments, scientists at Purdue University compared weight gain and eating habits in rats whose diets were supplemented with sweetened food containing either zero-calorie saccharin or sugar. The report, published in Behavioral Neuroscience, presents some counterintuitive findings: Animals fed with artificially sweetened yogurt over a two-week period consumed more calories and gained more weight  mostly in the form of fat  than animals eating yogurt flavored with glucose, a natural, high-calorie sweetener. It's a continuation of work the Purdue group began in 2004, when they reported that animals consuming saccharin-sweetened liquids and snacks tended to eat more than animals fed high-calorie, sweetened foods. The new study, say the scientists, offers stronger evidence that how we eat may depend on automatic, conditioned responses to food that are beyond our control. What they mean is that like Pavlov's dog, trained to salivate at the sound of a bell, animals are similarly trained to anticipate lots of calories when they taste something sweet  in nature, sweet foods are usually loaded with calories. When an animal eats a saccharin-flavored food with no calories, however  disrupting the sweetness and calorie link  the animal tends to eat more and gain more weight, the new study shows. The study was even able to document at the physiological level that animals given artificial sweeteners responded differently to their food than those eating high-calorie sweetened foods. The sugar-fed rats, for example, showed the expected uptick in core body temperature at mealtime, corresponding to their anticipation of a bolus of calories that they would need to start burning off  a sort of metabolic revving of the energy engines. The saccharin-fed animals, on the other hand, showed no such rise in temperature. "The animals that had the artificial sweetener appear to have a different anticipatory response," says Susan Swithers, a professor of psychological sciences at Purdue University and a co-author of the study. "They don't anticipate as many calories arriving." The net result is a more sluggish metabolism that stores, rather than burns, incoming excess calories. Swithers stops short of saying that the animals in her study were compelled to overeat to compensate for phantom calories. But she says that the study does suggest artificial sweeteners somehow disrupt the body's ability to regulate incoming calories. "It's still a bit of a mystery why they are overeating, but we definitely have evidence that the animals getting artificially sweetened yogurt end up eating more calories than the ones getting calorically sweetened yogurt." Though it's premature to generalize based on animal results that the same phenomena would hold true in people, Swithers says, she notes that other human studies have already shown a similar effect. A University of Texas Health Science Center survey in 2005 found that people who drink diet soft drinks may actually gain weight; in that study, for every can of diet soda people consumed each day, there was a 41% increased risk of being overweight. So even though her findings were in animals, says Swithers, they could lead to a better understanding of how the human body responds to food, and explain why eating low-calorie foods doesn't always lead to weight loss. "There is lots of evidence that we learn about the consequences about eating food," she says. "And we have physiological responses to food that are conditioned." So does that mean you should ditch the artificial sweeteners and welcome sugar back into your life? Not exactly. 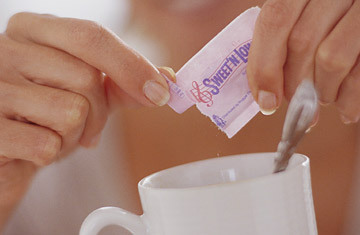 Excess sugar in the diet can lead to diabetes and heart disease, even independent of its effect on weight. But it's worth remembering that when it comes to counting calories, it's not just the ones you eat that you have to worry about. The calories you give up matter too, and they may very well reappear in that extra helping of pasta or dessert that your body demands. Your body may actually be keeping better count than you are. See nine kid foods to avoid. See pictures of what makes you eat more food.